Leaders from UC Santa Cruz, San Jose State University, and the Foothill-De Anza Community College District met earlier this month at NASA Ames Research Center at Moffett Field to announce the formation of a partnership to address Silicon Valley's critical education and workforce needs. The "collaborative" envisions joint research and education programs among the institutions, to take place at the proposed NASA Research Park. Joining UCSC Chancellor M.R.C. 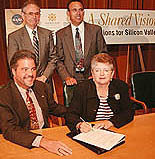 Greenwood at a September 5 news conference announcing the partnership were Robert Caret (also seated), president of SJSU; Leo Chavez (standing, right), chancellor of community college district; and NASA Ames Research Center Director Henry McDonald.